and need your yearly Audit? 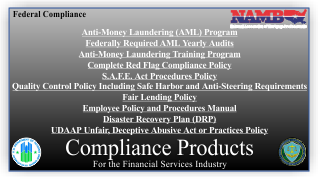 We have taken a very complex issue and developed a common sense AML program that will accomplish what FenCENs intent is: to help prevent money laundering and fraud, while making your firm compliant. By utilizing the AML Check List we provide when beginning a new file, we have created a simple assessment to screen each and every new potential customer. The best part, we do all the work for you by providing your firm with a customized compliance and supervisory procedures written policy.